H was 17 years old. He's playing at the Rainbow Bridge. The last few days have been tough. I knew the decision was coming this week. Evidently, H didn't want me to have to go through that so he took matters into his own paws. His big heart just finally gave out. H was a world traveler. He aspired to be the finance minister of Abu Dhabi. 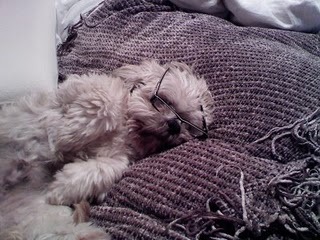 He read the wall street journal and loved to invest in puppy stocks and bonds. He came up with the idea for the doggie slot machines in the casino and stashed his money in shoe boxes. He converted currency into sonic cards and doggie treats. I can tell you that I'll spend most of the day crying because I am going to miss this little guy more than I ever could have imagined. And you loved in return with all your heart.